What happened in the last 3 months? What is our expectation for the next 3 months? What was the situation in recent years? Weekly price movements of different steel products and grades in major markets can be viewed comparatively in the SteelOrbis Historical Steel Prices section. Market trends can thus be seen more clearly, while desired charts can be created and used in reports or presentations. All charts included in the Orbis HRC CIS Export Forecaster are for HRC FOB CIS prices, while prices and charts for other flat steel grades and regions can be found on our website. 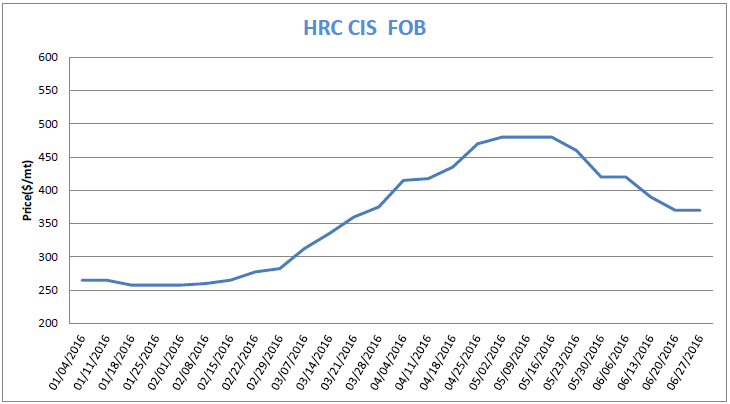 In the first half of January, supported by strong demand ex-CIS HRC prices continued their upward trend which had started in December, while in the second half of the month ex-CIS HRC prices moved sideways. Ex-CIS slab prices moved up during January, increasing by $50/mt on average to $535-545/mt FOB by the end of the month. 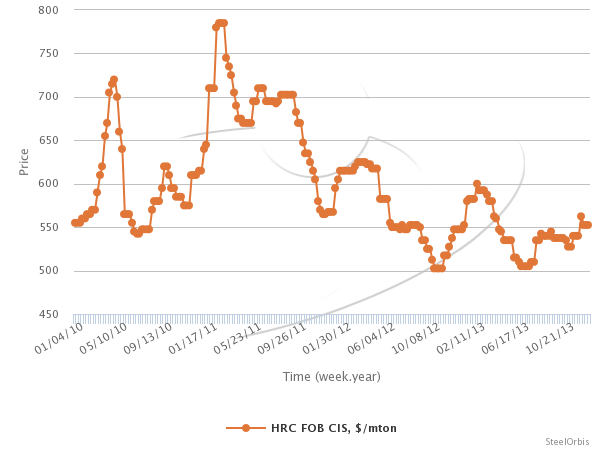 Ex-CIS HRC prices entered the month of February on a sideways trend. 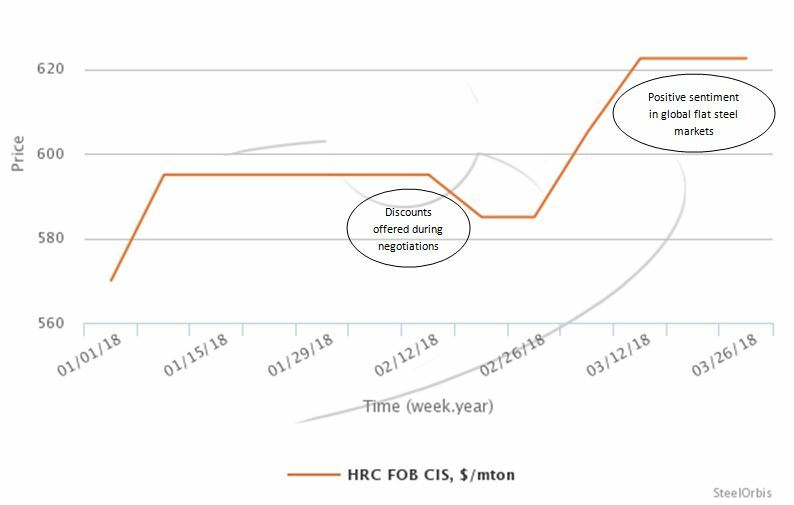 Benefiting from the absence of Chinese sellers due to the Chinese New Year holiday in mid-February, CIS-based producers reduced their prices in order to increase their sales and so ex-CIS HRC prices softened during the remainder of the month. Despite the decline seen in ex-CIS HRC prices, ex-CIS slab prices did not soften in February as demand remained strong. Accordingly, prices of ex-CIS slab moved sideways in the given month, maintaining the levels reached in January. As a result of ongoing increases in global flat steel prices, in the first half of March ex-CIS HRC prices moved upwards, while they moved on a stable trend in the second half of the month. 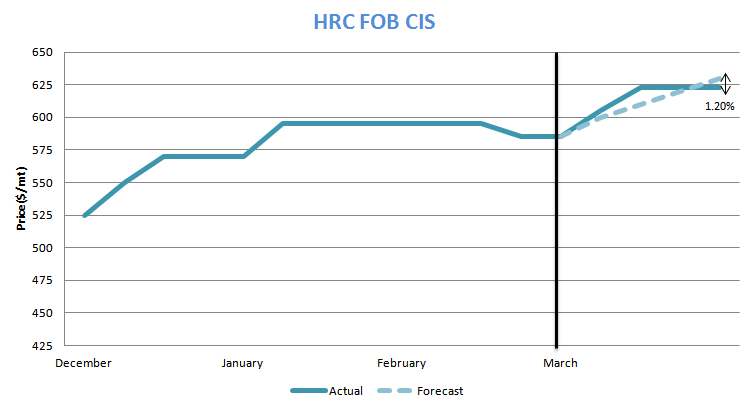 In the Orbis HRC CIS Export Forecaster for March this year, we had predicted that ex-CIS HRC prices would continue to move upwards due to the positive sentiment in global flat steel market, the ongoing increases in global raw material prices and the expectations of a revival in HRC booking activity in CIS-based suppliers’ target markets. Despite the sharp declines observed in global iron ore prices, in line with our prediction, ex-CIS HRC prices continued to increase in the first two weeks of March since domestic HRC prices in Turkey - one of the target destinations for CIS-based HRC suppliers - remained strong and since Chinese HRC exporters refrained from making sharp reductions to their price levels, in expectation that the positive sentiment in the global flat steel market would continue. 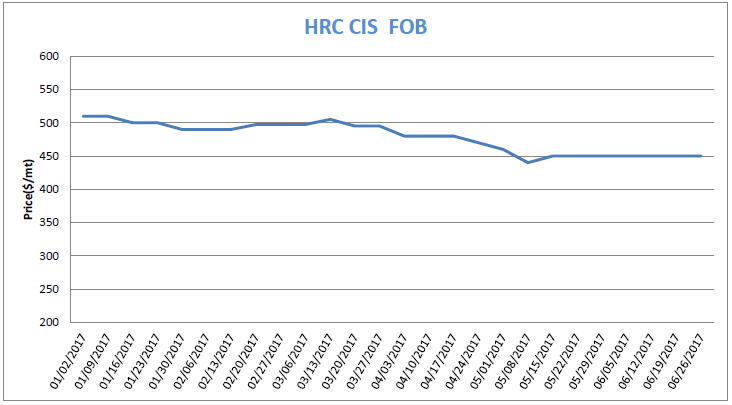 As of the second half of the month, ex-CIS HRC prices switched to a sideways movement due to the negative sentiment in the Chinese domestic market, the declines in global raw material prices and also since Chinese HRC export offers started to soften. 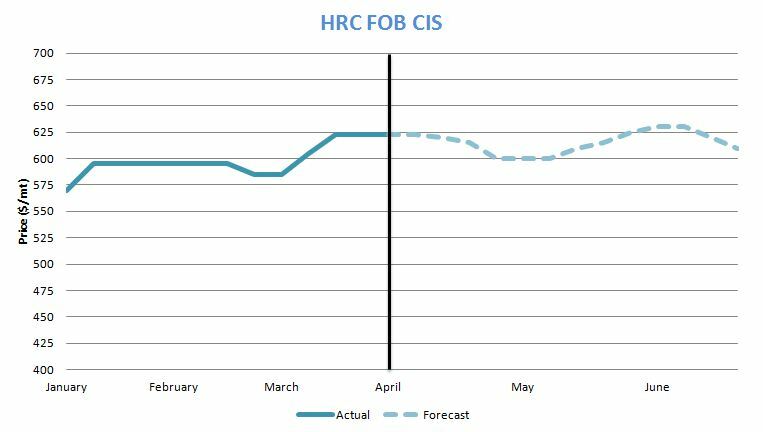 As a result, the deviation between our forecast price and the actual price for ex-CIS HRC as of the end of March stands at 1.20 percent. Having returned from the Chinese New Year holiday in the last week of February, Chinese HRC producers increased their prices for the domestic market even though no significant recovery was observed in terms of demand, supported by increases in HRC futures prices at Shanghai Futures Exchange. However, in early March, the higher prices failed to gain acceptance since domestic HRC demand in China still lacked strength, failing to reach anticipated levels. Subsequently, prices in the local Chinese HRC market started to soften in the second week of March. As of the second half of the month, domestic HRC prices in China indicated further slight decreases due to the declines in the steel futures market and the lack of a significant recovery of demand. Besides the weakness of demand, traders in the local Chinese HRC market started to experience liquidity problems and accordingly prices continued to decline towards the end of the month. Chinese HRC export offers entered the month of March on an upward trend, supported by the increases in global HRC prices. However, Chinese HRC export prices weakened slightly as of mid-March since demand was still weak and as prices had been moving downwards in the domestic market. Nevertheless, the declines were limited with support from the positive outlook for the flat steel market for the coming period. Ex-CIS HRC offers moved upwards in the first half of March due to the positive sentiment in the global flat steel market and as Chinese HRC export offers began the month on an upward trend. However, in the second half of the month, the uptrend of ex-CIS HRC prices was replaced by a sideways movement amid factors including weak HRC demand in the local Chinese market, the softening of Chinese HRC quotations and the ongoing declines in global iron ore prices. 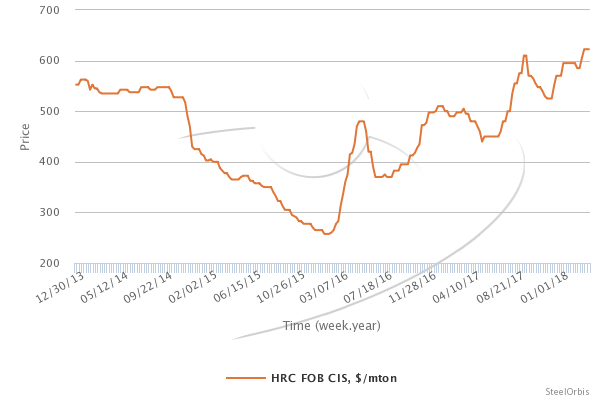 Having started the month at $580-590/mt FOB, ex-CIS HRC prices increased by a total of $37.5/mt during March, closing the month at $615-630/mt FOB. Having trended sideways up to mid-March, domestic HRC prices in Europe started to move up in the middle of the month in question amid the ongoing rises seen in import flat steel offers to the region, including increases in ex-CIS slab quotations. As a result, domestic HRC prices in Europe reached a six-year high in March. The higher HRC quotations in Europe have gained acceptance from buyers following the European Commission's announcement of a safeguard investigation into steel imports. The rapid rises seen in global HRC prices have caused purchases in the Middle East and North Africa (MENA) region to come to a near-halt. 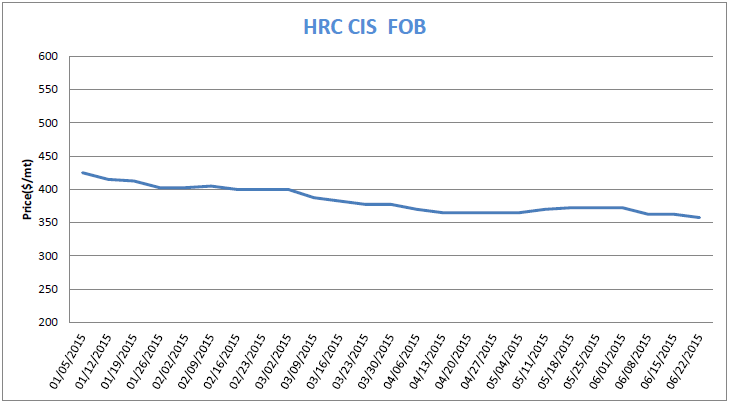 Meanwhile, higher ex-CIS HRC prices have failed to gain acceptance in the Gulf region due to weakness of demand. Turkish steel mills increased their domestic HRC quotations throughout March amid the revival in demand and the upward movement of global steel prices. However, buyers maintained a cautious stance as regards concluding new deals, causing demand to decline somewhat. In the meantime, ex-CIS HRC prices continued to move up, while Turkish buyers considered ex-CIS HRC quotations and delivery times to be attractive and so their purchases of import HRC from the CIS region accelerated. 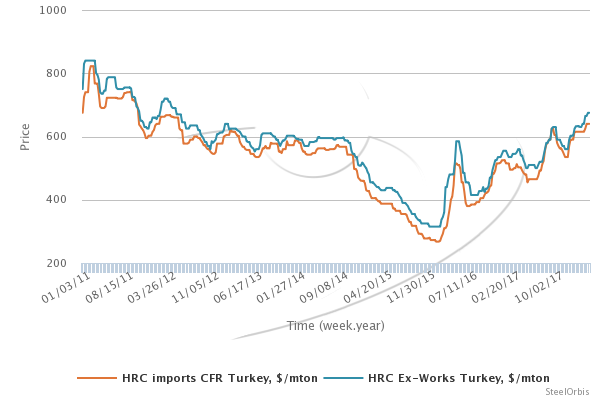 On the other hand, Turkish steel producers also raised their HRC export prices in line with the ongoing upward trend in their target markets. 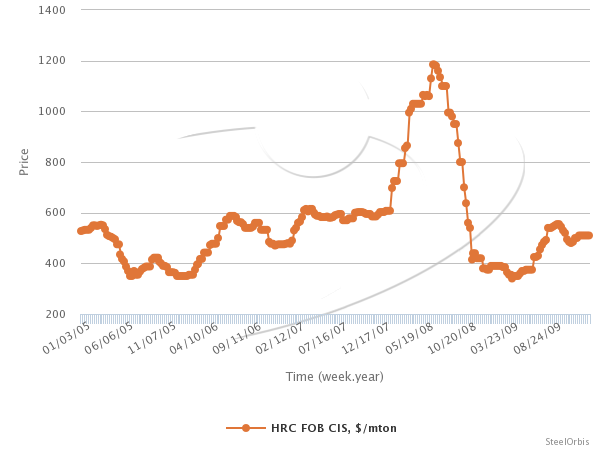 Ex-CIS slab quotations increased by a total of $35/mt in March supported by the strong trend of ex-CIS HRC prices. Having returned to the market in the last week of February, Chinese steel producers replenished their iron ore inventories in the following week, thereby pushing up global iron ore prices. However, Chinese domestic steel demand remained below expectations and steel futures prices in China indicated sharp declines, negatively affecting iron ore prices. In the meantime, the high levels of low grade iron ore inventories in China put further pressure on prices of ore. Consequently, iron ore prices indicated sharp declines in March, decreasing to $65/mt. Due to the announcement of restrictions on railway transportation and the occasional impact of adverse weather conditions on mine and port operations, there were concerns that coking coal supply in Australia would be reduced. Accordingly, Australian coking coal prices increased in early March. However, amid the lack of a strong increase in Chinese steel production due to weak demand, buyers who were already expecting a decrease in coking coal prices postponed their purchases. As this put pressure on prices, the uptrend seen in early March was replaced by a downward movement. The gap seen between hard coking coal prices and premium hard coking coal prices was due to the sharper declines in prices of premium coking coal. Global electrode supply did not indicate any recovery in March, while ladle furnace electrode prices were at higher levels compared to February. As a result, prices of graphite electrodes for ladle furnaces, which had softened to $9,000-11,000/mt in the spot market at the beginning of the year, started to increase in March, once again rising above the level of $11,000/mt. Meanwhile, electric arc furnace electrode prices remained above $22,000/mt in the spot market. Having increased in the first week of March, import scrap prices in Turkey remained unchanged in the second week despite sluggish demand. However, import scrap prices came under pressure and started to soften as of the third week of the month due to the ongoing weakness of demand and the sharp price declines seen in China. As April begins, trade tensions between China and the US have increased. This has negatively affected Chinese steel futures prices and put pressure on HRC prices in the domestic spot market. Meanwhile, in China HRC demand is weak and HRC inventories are at high levels. Consequently, Chinese domestic HRC prices will likely come under increased pressure in the short term. The negative outlook in the Chinese domestic market amid high HRC inventories has resulted in the downward movement of Chinese HRC export prices, while the Section 232 measures in the US have also put pressure on Chinese HRC export prices. However, Chinese HRC suppliers will likely avoid making sharp reductions to their export prices to maintain the levels already reached by global flat steel prices and also taking into account rising raw material costs. They are expected to continue their sales by giving small discounts. HRC inventories in the Middle East and North Africa (MENA) region are at low levels entering the month of April. In the short term, buyers in the MENA region are expected to resume purchases to replenish their inventories and ex-CIS HRC prices to the countries in question will likely soften amid downward pressure from buyers. At the start of April, demand is sluggish in the EU flat steel market due to the Easter holiday, but is expected to pick up after the holiday. As a result of the safeguard investigation launched by the EU against 26 steel products, the already limited flat steel import volumes arriving in the EU are expected to decline further and European domestic HRC prices are likely to increase. As the month of April begins, Turkish buyers consider domestic HRC prices to be on the high side and delivery times for domestic HRC to be long. Accordingly, in the short term Turkish buyers will likely continue to conclude bookings of ex-CIS HRC to meet their needs. Slab buyers globally are still putting pressure on prices, while Chinese HRC export prices have softened. Consequently, the uptrend of ex-CIS slab prices is expected to come to an end in the short term. At the start of April, Chinese domestic finished steel demand remains weak and iron ore inventories at Chinese ports are still high. Additionally, Chinese HRC producers are unable to reduce their iron ore stocks even though the winter season production cuts have ended. Accordingly, in the short term Chinese steel producers are not expected to build up their iron ore inventories and global iron ore demand will likely remain weak. As April begins, Chinese domestic steel demand has not improved in line with expectations and coking coal inventories in China remain high, resulting in increased pressure on Australian coking coal prices. In the short term, Australian coking coal prices are expected to indicate further declines, with some fluctuations. The global electrode supply shortage is not expected to be resolved in the short term. Accordingly, steel mills that do not have supply contracts will likely continue to buy high-priced electrodes from the spot market. Meanwhile, as buyers in other markets are willing to pay higher prices than Turkish buyers for contracts in the coming months, electrode suppliers are expected to focus on these markets rather than on Turkey in order to increase their profitability. As a result, Turkish mills are likely to face further problems in electrode supply. As the month of April begins, Turkish steel producers have started to put additional pressure on scrap prices as their production costs have increased due to higher electricity costs and also since their domestic and export sales have been quite slack. As the global market continues to be characterized by uncertainty following the the US decision to impose duties on steel imports and the EU's initiation of a safeguard investigation into steel imports, steel demand in the global market is not expected to recover in the short term and Turkish mills are expected to exert increased pressure on global scrap prices. Following the EU’s launching of a safeguard investigation on 26 steel product types in order to protect its own steel industry from threat of trade diversion due to the US Section 232 tariffs, the Turkish Steel Exporters' Association (CIB) has stated that, if the EU imposes safeguard measures, the Turkish steel industry will be severely impacted. According to the CIB, in accordance with the customs union agreement between Turkey and the EU, Turkey seeks to be excluded from the safeguard investigation. The CIB has stated that the unease in the EU steel sector arising from the Section 232 tariffs is also valid for the Turkish steel industry, adding that the EU should not evaluate Turkey as a third country. CIB chairman Namik Ekinci stated that the Turkish steel industry is not a threat to the EU, but a close trading partner, considering the significant trade volume between the two sides. Therefore, the EU and Turkey should act together against the threats coming from third countries, Mr. Ekinci added. According to the CIB, in 2017 Turkey’s steel exports to the EU totaled 5.6 million mt, of which 4.6 million mt were comprised of the 26 product groups mentioned in the safeguard investigation. In the same year, Turkey imported five million mt of steel products from the EU. The municipal government of Handan in China’s Hebei Province has announced that from April 1 to November 15 this year the steel industry and coking industry in the city will be subject to a 25 percent production cut rate, in order to ensure improved air quality. In a speech on infrastructure in Ohio Thursday, Donald Trump warned that he might “hold up” the recently renegotiated Korea-US free trade agreement (KORUS) in an effort to gain more leverage in potential talks with North Korea. Under the terms of the trade pact, South Korea will be permanently exempt from the Section 232 steel tariffs in exchange for decreasing their total steel exports to the US by 30 percent of the last three years’ average. The Iranian Steel Producers Association (ISPA) has announced on its online portal Chilan Magazine that the government of Iran has reduced import tariffs on certain flat steel products, including hot rolled coil (HRC), cold rolled coil (CRC) and coated sheets. Accordingly, the import tariffs for hot rolled coils with thickness up to 4.75 mm and the API-grade sheets which are used in the oil, gas and petrochemical industries have been reduced to five percent from 10 percent. Meanwhile, import tariffs for cold rolled coils with thicknesses ranging between 0.5 mm and 1.0 mm have been reduced to 10 percent from 30 percent. In addition, tariffs on imports of coated sheets have been reduced to 20 percent from 26 percent, while tariffs on tin plate imports have been cut to 15 percent from 26 percent. The ISPA stated that, in recent months, it has opposed to the decision of the government to reduce tariffs on these products. In March this year, Mahmoud Eslamian, head of the association, told government officials that steel prices in Iran are lower than global prices, and so the reduction of import tariffs will not be for the benefit of the country. China and the US have quietly started negotiating to ease tensions following US President Donald Trump’s decision to impose tariffs and quotas on steel and aluminium imports under Section 232, as reported by the Wall Street Journal. Following the US government's proposal to impose tariffs on $60 billion worth of imports from China within the context of intellectual property rights on Thursday, March 22, the Chinese government had announced that it was considering a retaliation measure on $3 billion worth of imports from the US. According to the report, the two countries have started negotiating to improve US access to Chinese markets after a week filled with harsh words from both sides. China's Vice Premier Liu He, US Treasury Secretary Steven Mnuchin and US Trade Representative Robert Lighthizer have participated in the negotiations. Meanwhile, Chinese Premier Li Keqiang stated that China is working towards dialogue with the US on trade but is also prepared for a trade war, Chinese state television reported. The European Steel Association (EUROFER) has stated that it welcomes the European Commission’s (EC) safeguard investigation into 26 steel product types to prevent trade deflection into the EU. The basis for a safeguard comes from the need to defend the EU’s steel sector against product flows deflected from the US as a result of the Section 232 measures. “The investigation must act fast and actually put safeguard measures in place on as wide a range of products as possible, to prevent harm to the industry from trade deflection. As the European Council said on Friday, the EU has the right to ‘respond to the US measures as appropriate and in a proportionate manner’ - and EUROFER urges the European Commission to impose provisional measures as swiftly as is possible under EU - and WTO - law,” stated Axel Eggert, director general of EUROFER. “The fact that the EU and other countries are out of the US measures ­for now does not mean we should not prepare. Indeed, in the first two months of the year, finished steel imports rose by 12 percent in the EU - over and above the record import volume of 2017. The volumes that could potentially be deflected to the EU market measure in the millions of tons and would have a devastating pricing impact,” added Mr. Eggert. The US-South Korea deal to limit Korean steel exports to 2.7 million mt - 70 percent of the average of 2015-2017 volumes - could well see the remaining 30 percent deflected to the EU. Exports to the EU from South Korea have more than doubled since 2014 to over 3.1 million mt. “The EU steel sector has only just got back on its feet. This safeguard action - if sufficiently broad when deployed at the provisional and the definitive stages - could make the difference between a continued recovery or a return to the dark days of the steel crisis,” concluded Mr Eggert. The European Commission (EC) has issued today, March 26, via publication in the Official Journal of the European Union a notice of initiation of a safeguard investigation concerning imports of steel products, due to the fact that "imports of certain steel products have recently increased sharply, showing that there is sufficient evidence that these trends in imports appear to call for safeguards measures". "The information currently available to the Commission indicates that total imports of the products concerned increased from 17.8 million metric tons to 29.3 million metric tons in the 2013-17 period. Imports of the products concerned increased by around 65 percent between 2013 and 2016. The main increases took place in 2015 and especially in 2016, when they reached 28.6 million metric tons. Imports of the products concerned have remained at a significant level thereafter," reads the document. "The investigation will determine whether, as a result of unforeseen developments, the products concerned are being imported into the Union in such greatly increased quantities and/or on such terms or conditions as to cause, or threaten to cause, serious injury to the Union producers of like or directly competing products," the notic continued. "In order to obtain the information it deems necessary for its investigation, the Commission will send questionnaires to the known producers of the like or directly competing products and to any known associations of producers, in the Union. The completed questionnaires must reach the Commission within 21 days from the date on which they are sent," the EC stated. If the Commission determines that measures are necessary, the Commission shall take the necessary decisions, no later than nine months from the date of initiation, unless exceptional circumstances exist, in which case that time limit may be extended by a maximum period of two months. The safeguard investigation into imports of 26 steel product types exclude; billets, slabs, blums, wires, cast-iron pipes and sections, and iron&steel goods excluding pipes. Two large Russian steelmakers with divisions in the US are seeking relief from Section 232 tariffs on their semi-finished imports. NLMK USA has formally requested an exemption for Russian slab that it imports for processing in US facilities while Russian-owned Swiss steelmaking giant Severstal filed a lawsuit through its subsidiaries against the US government seeking a court action to stop tariffs against their imports. The suit names Trump and the US government as co-defendants, along with US Customs and Border Protection, Acting CBP Commissioner Kevin McAleenan, the Department of Commerce, and Commerce Secretary Wilbur Ross. Severstal wants Trump’s tariffs ruled unconstitutional as applied to the Swiss steel importer, including vessels in transit with goods under contracts it entered prior to March 8. The complaint adds, “tariffs will effectively wipe out the plaintiffs’ painstakingly built US business and ruin the goodwill and reputation that has taken over 20 years to grow and develop.” Severstal does not qualify for the temporary EU exemption. According to news reports, the US and South Korea agreed to revise the US-Korea Free Trade Agreement (KORUS). As part of the changes, South Korea will decrease its steel exports to the US by 30 percent of the past three years’ average, in exchange for an indefinite exemption on the Section 232 steel tariffs. Exemptions for the EU, Brazil, Australia, Argentina, Canada and Mexico will expire as of May 1. South Korea’s new annual quota will be about 2.68 million metric tons of steel exports. Currently, the country is the third-largest steel exporter to the US. South Korea’s steel association said in a statement it was a “relief” that South Korea has been excluded from US steel tariffs, but regrettable it was unable to secure higher quotas. Additionally, as part of the KORUS revision, South Korea and the US agreed to extend US tariffs on Korean pickup trucks by 20 years until 2041. Currently, there are no South Korean automakers exporting pickup trucks to the US. Also US automakers will be able to export to South Korea 50,000 vehicles per automaker per year that meet US safety standards, not necessarily Korean standards, up from 25,000 vehicles previously. A report issued late Thursday by US Customs and Border Protection indicates that the temporary exclusions for US steel tariffs under Section 232 will expire as of May 1. Starting that day, all countries of origin will be subject to the 25 percent tariff on US steel imports. The tariffs are effective with respect to goods entered, or withdrawn from warehouse for consumption, on or after March 23, 2018. Countries with temporary exclusions to the tariffs include Canada, Mexico, Australia, Argentina, South Korea, Brazil and member countries of the European Union (Austria, Belgium, Bulgaria, Croatia, Cyprus, Czech Republic, Denmark, Estonia, Finland, France, Germany, Greece, Hungary, Ireland, Italy, Latvia, Lithuania, Luxembourg, Malta, Netherlands, Poland, Portugal, Romania, Slovakia, Slovenia, Spain, Sweden and the United Kingdom). Customs and Border Protection noted that exclusions are based on the country of origin, not the country of export. The merchandise covered by the additional duties may also be subject to pre-existing antidumping and countervailing duties. Following the US decision to temporarily exclude some countries, including the European Union, from its Section 232 import tariffs until May 1, Axel Eggert, director general of the European Steel Association (EUROFER), has stated that the US has only suspended the EU’s inclusion provisionally, while adding that EUROFER is pushing for safeguard measures that ensure the stability of the EU steel market since the risk of damaging trade deflection remains high. “The European steel industry has crawled through a decade of exogenously-induced crisis - a crisis that we are only just emerging from. We cannot face seeing this fragile recovery put at risk as a result of steel deflected from the US market. This is why we continue to call for quickly deployed, broad, quota-based safeguards that keep the EU market open but fully reflect the scope of the US measure,” stated Mr. Eggert. According to EUROFER, the US Section 232 investigation covered a wide range of steel products, including finished, semi-finished and pipes, of all qualities, including stainless. The EU exports about five million mt of such products to the US every year as one of its most reliable trade partners. “The danger to the EU steel market has not disappeared. The EU is a larger importer of steels than the US - 40 million mt last year compared to the US’ 35 million mt. In the first two months of 2018, the mere whisper that the US would impose measures has coincided with a 12 percent surge in imports to the EU,” added Mr. Eggert. “It bears repeating: the EU has only been provisionally suspended from measures. We now need clarity about ways the EU and the US can come to a longer-term, common understanding before May 1 if the exclusion is to be indefinite,” concluded the EUROFER director general. Chinese President Xi Jinping held a phone conversation with German Chancellor Angela Merkel on Saturday, March 17, and discussed the problem of global overcapacities in the steel market, emphasizing the importance of close multilateral cooperation on trade, according to Reuters. Jinping and Merkel agreed to deepen the strategic partnership between their two countries, which both face the US steel and aluminum tariffs, and to continue efforts to work toward solutions for the global overcapacity in the framework of the G20 Global Forum. Meanwhile, Reuters also stated that German Economy Minister Peter Altmaier will visit Washington this week to press for an exemption from the US steel and aluminum tariffs. The European Commission (EC) has announced that it has rejected the proposal for the imposition of a minimum import price (MIP) instead of fixed duties per metric ton concerning imports of certain hot rolled flat products of iron, non-alloy or other alloy steel originating in Brazil, Iran, Russia and Ukraine. The commission launched an antidumping (AD) duty investigation in July 2016 on the mentioned imports from the four countries and imposed definitive duties ranging between €96.5/mt and €17.6/mt. During the investigation that led to the imposition of the definitive duties, six exporting producers from Brazil, Iran, Russia and Ukraine offered the imposition of a minimum import price instead of fixed duties per metric ton. The companies that offered the minimum import price are Brazil-based Companhia Siderúrgica Nacional and Usinas Siderurgicas de Minas Gerais SA, Iran-based Mobarakeh Steel Company, Russia-based PJSC Magnitogorsk Iron and Steel Works and Novolipetsk Steel OJSC and Ukraine-based Metinvest Group. The commission stated that the minimum import price is inadequate as it will not remove the injurious effects of dumping for all product types, in particular the most expensive ones. Accordingly the definitive duties will remain in place. The municipal government of Tangshan in China's Hebei Province has approved the draft steel production plan for the post-winter period which extends steel production cuts from March 16 to November 14, according to Reuters. Reuters stated that, according to a statement from Tangshan Development and Reform Commission, steelmakers in Tangshan will implement production cuts of 10 percent to 15 percent, based on air quality, location and capacity size, until November 14. Accordingly, steel mills in the main part of the city, including Tangsteel Company, a subsidiary of Hebei Iron and Steel (HBIS) Group, will be ordered to cut production by as much as 15 percent, while other mills in the city will cut production by 10 percent, and this could be increased if air quality worsens. In addition, mills that have not obtained licenses to discharge pollutants will have to halt production. According to a new report issued by the China Iron and Steel Association (CISA), as of February 28 this year imported iron ore inventory at Chinese ports totaled 159 million mt, up 5.10 percent month on month and rising by 21.98 percent year on year. According to the CISA, as of February 28 this year, the composite steel price index (CSPI) was up 0.43 percent compared to January 31, while import iron ore prices were up 7.17 percent in the given period. Import iron ore prices rose quicker than steel prices, which will exert a negative impact on steelmakers' profitability. Following the Chinese New Year holiday, market participants have been upbeat on the future prospects for steel prices. China's crude steel output will increase, which will result in stronger demand for import iron ore. However, oversupply of import iron ore will continue. It is thought that import iron ore prices in China will continue their fluctuating trend in the coming period, the CISA said. The European Union is aiming to impose 25 percent retaliatory tariffs on a range of products, including steel products, industrial goods, textile, consumer and agricultural goods, imported from the US, targeting €2.8 billion of American goods, according to Bloomberg. Bloomberg stated that the EU especially targets iconic US brands in order to raise political pressure on the US President Trump’s plans to impose tariffs on steel and aluminum imports. The EU’s list targets US imports of textiles, cosmetics, other consumer goods, motorbikes and pleasure boats worth around €1 billion, alcoholic beverages, corn and other agricultural products amounting to €951 million, and steel and other industrial products totaling €854 million. The European Commission is also considering filing a complaint to the World Trade Organization (WTO) against the US and introducing safeguard measures to prevent massive trade diversion in the EU because of the US tariffs on steel and aluminum products, according to the Bloomberg report. The Turkish Steel Producers Association (TCUD) has welcomed the US Court of International Trade’s (CIT) decision not to impose countervailing duty (CVD) on imports of certain hot rolled flat steel products from Turkey as per the request of US-based steel producers and stated that the CIT’s approval of the view of the US International Trade Commission (USITC) that the subsidy rates for the mentioned imports are negligible has great importance for the Turkish steel industry, since it shows that Turkey’s steel exports comply with fair trade rules. Meanwhile, the TCUD also stated that, as a result of the US measures against steel imports, the countries that export steel to the US may direct their steel exports to Turkey’s steel market, which is unprotected. Accordingly, the TCUD pointed out that urgent measures should be taken to protect Turkey’s steel industry from cheap and low quality imports. International credit rating agency Moody’s has stated in a report regarding the Section 232 investigation of the US that the US plan to impose tariffs on steel imports is credit negative for Moody's-rated Asian steel producers, but the impact will not prove material. According to Moody's, the impact of the planned 25 percent tariff on steel imports for all countries would be manageable for the Asian steel sector and Moody's-rated steelmakers in the region, because exports to the US account for relatively small portions of their total steel production. The credit rating agency points out that China's direct steel exports to the US represented only one percent of total exports during the first nine months of 2017. In addition, the reliance of Chinese steel companies on exports decreased substantially in 2017. In contrast, the South Korean steel sector demonstrates a relatively high exposure to US exports, given its position as the third-largest steel exporting country to the US during the first nine months of 2017. Nevertheless, even in the case of South Korea, steel exports to the US are mostly focused on pipes and tubes (57 percent of exports to the US in 2017, according to the Korea Iron & Steel Association), product types that the two Moody's-rated steelmakers, POSCO and Hyundai Steel Company, show little exposure to. The US Court of International Trade (CIT) has announced that it has declined US-based steel producers’ request to impose countervailing duty (CVD) on imports of certain hot rolled flat steel products from Turkey, supporting the view of the US International Trade Commission (USITC) that the subsidy rates for the mentioned imports are negligible and therefore no countervailing duty order would be issued on imports of these products from Turkey. In August 2016, the US Department of Commerce (US DOC) calculated subsidy rates of 0.34 percent for Colakoglu Metalurji A.S. and Colakoglu Dis Ticaret A.S and 6.01 percent for Eregli Demir ve Celik Fabrikaları T.A.S and Iskenderun Demir ve Celik T.A.S. In September 2016, the ITC decided not to impose countervailing duty because of the negligibility of these subsidy rates. Accordingly, in late 2016, the US-based companies appealed at the International Trade Court against the ITC’s decision. They also have the right to appeal against the court’s decision. The government of China’s Anhui Province has announced that it plans to eliminate 1.0 million mt of iron-making capacity and 1.28 million mt of steel production capacity in 2018. In 2017, Anhui Province eliminated 0.62 million mt of iron-making capacity and 0.64 million mt of steel production capacity. International credit ratings agency Fitch Ratings has stated in its 2018 Global Steel Outlook report that it expects the capacity closures which have already taken place in China to continue to have a positive impact on steel markets globally in the current year. These closures have seen capacity utilization rates in China rise to around 84-85 percent, which has led to higher domestic prices and greater profitability for producers. They have also resulted in lower export volumes, which have improved the market balance and domestic prices in other regional steel markets. The actual result in these markets will depend on consumption trends, but the background is positive. Fitch expects Chinese steel demand to ease in 2018 due to the slowdown in the property market, a reduction in supply, and more rigorous enforcement of environmental protection policies. The credit ratings agency believes the overall market will be more stable in 2018 than in previous years. Fitch also expects Chinese steel prices to be moderately lower on average in 2018 amid decreased demand. Meanwhile, in the US, Fitch expects prices to moderate in the second half of this year reflecting lower raw material costs and a modest rise in import competition. Fitch also expects solid North American steel demand supported by strong US auto and non-residential construction markets. According to Fitch, key market indicators for the European steel industry this year are at present uniformly positive. For demand Fitch expects growth in all of the key steel-consuming sectors - construction, automotive and mechanical engineering. The credit ratings agency forecasts demand growth of around five percent in India in 2018, driven mainly by a sustained increase in government infrastructure spending as the 2019 general election draws near. Fitch expects that the recovery in the Russian steel industry which started in 2017 will continue through 2018 with a moderate increase in steel demand of around 2-3 percent, underpinned by its expectations of continuously slow but steady GDP growth in the current year. Turkish Ministry of Economy has announced that it has imposed import duty on certain flat rolled steel products as of January 1, 2018. Accordingly, hot rolled flat steel products classified under Customs Tariff Statistics Position Numbers 720890801011 and 720890802011 are now subject to nine percent import duty, while certain cold rolled flat steel products classified under Customs Tariff Statistics Position Numbers 720990802111 and 720990802911 are subject to 10 percent import duty. Additionally, tinplate products which are classified under Customs Tariff Statistics Position Numbers 721240201921, 721250201011, 721250209011, 721250301011, 721250309011, 721250401011, 721250409011, 721250611011, 721250619011, 721250691011 and 721250699011 have been made subject to an import duty of 15 percent. Import duty for the products in question was zero until 2018. According to Turkey’s Ministry of Economy, while the import duty for hot rolled coil (HRC) has remained the same as of January 1, 2018, the five percent import duty collected from rolling mills for HRC imports has been reduced to 3.5 percent. In the January-October period of 2017, Turkey imported 3.5 million mt of HRC, while the country’s HRC imports amounted to 3.63 million mt in 2016.